Reforming Corporate Governance: The Key to Improving Executive Pay Jesse Fried Harvard Law School Washington D.C. May 4, 2010. 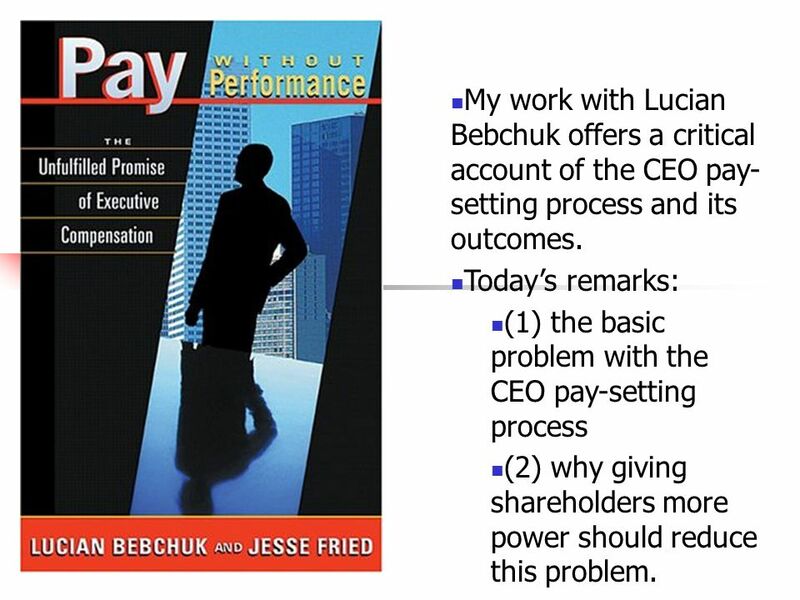 2 My work with Lucian Bebchuk offers a critical account of the CEO pay- setting process and its outcomes. 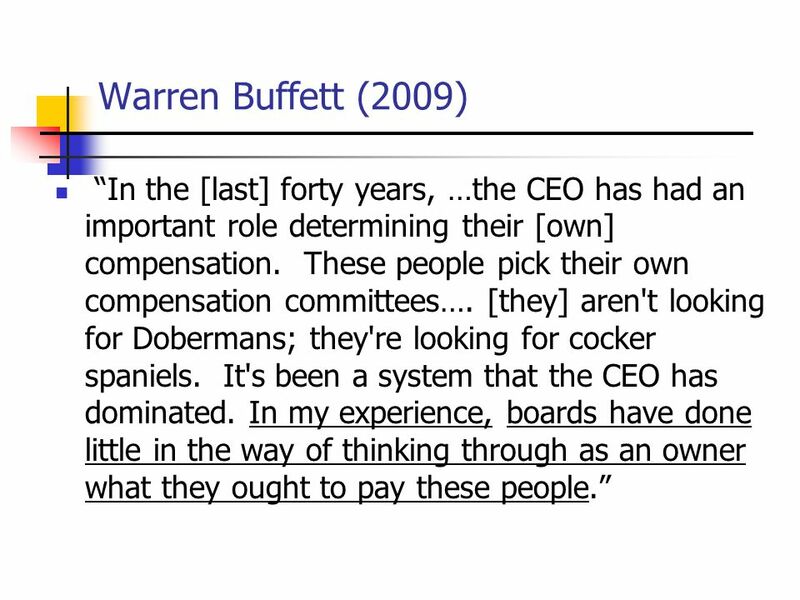 Today’s remarks: (1) the basic problem with the CEO pay-setting process (2) why giving shareholders more power should reduce this problem. 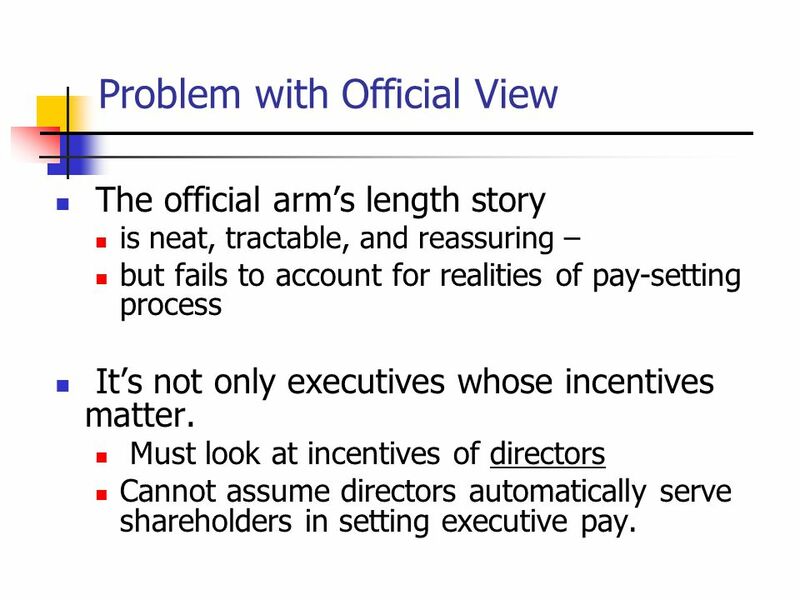 5 Problem with Official View The official arm’s length story is neat, tractable, and reassuring – but fails to account for realities of pay-setting process It’s not only executives whose incentives matter. 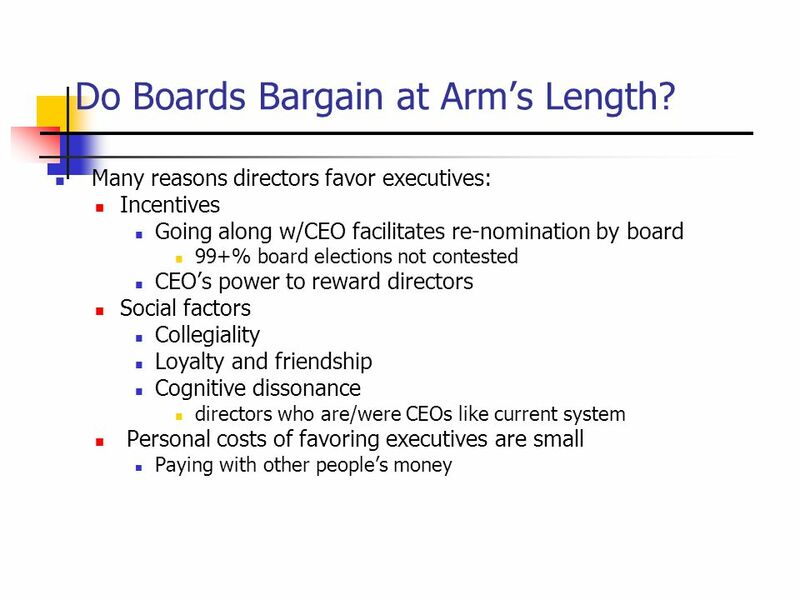 Must look at incentives of directors Cannot assume directors automatically serve shareholders in setting executive pay. 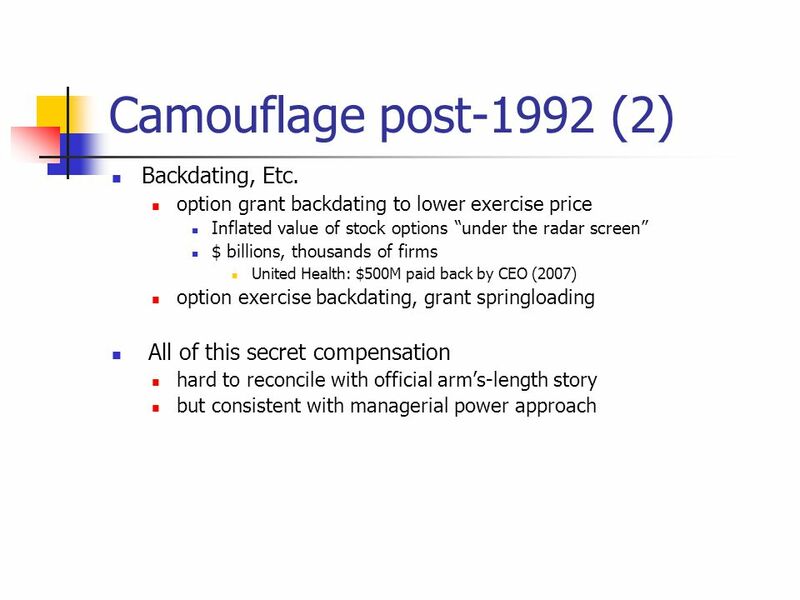 10 Camouflage pre-1992: An SEC official describes pre-1992 state of affairs as follows: “The information [in the executive compensation section] was wholly unintelligible.... Depending on the company’s attitude toward disclosure, you might get reference to a $3,500,081 pay package spelled out rather than in numbers. ………. Someone once gave a series of institutional investor analysts a proxy statement and asked them to compute the compensation received by the executives covered in the proxy statement. No two analysts came up with the same number. 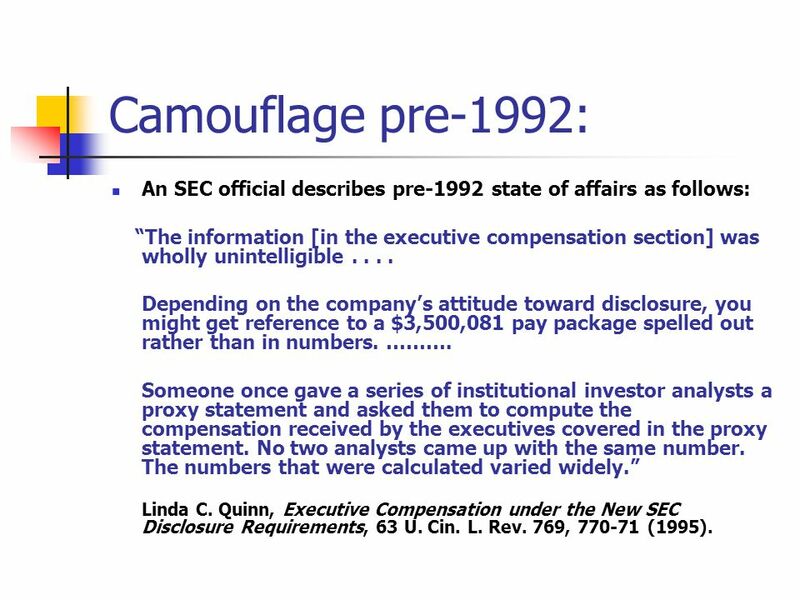 The numbers that were calculated varied widely.” Linda C. Quinn, Executive Compensation under the New SEC Disclosure Requirements, 63 U. Cin. L. Rev. 769, 770-71 (1995). 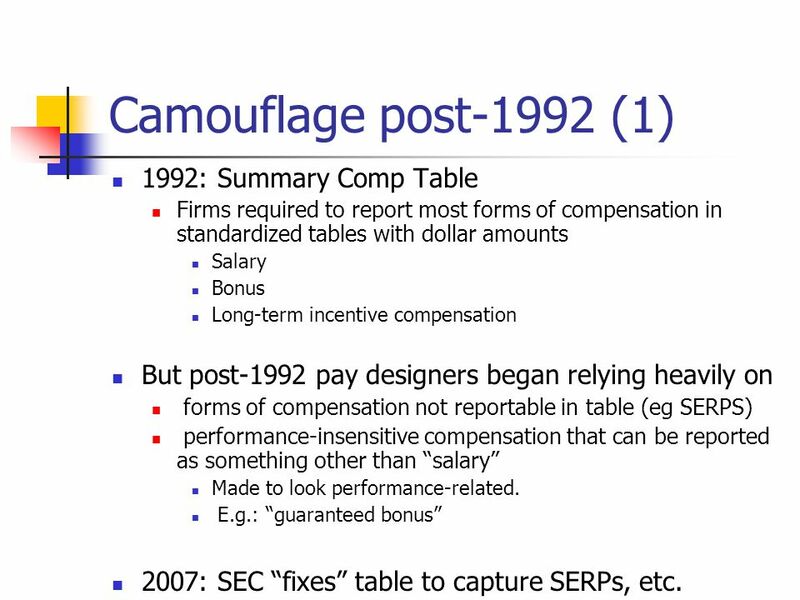 11 Camouflage post-1992 (1) 1992: Summary Comp Table Firms required to report most forms of compensation in standardized tables with dollar amounts Salary Bonus Long-term incentive compensation But post-1992 pay designers began relying heavily on forms of compensation not reportable in table (eg SERPS) performance-insensitive compensation that can be reported as something other than “salary” Made to look performance-related. E.g. 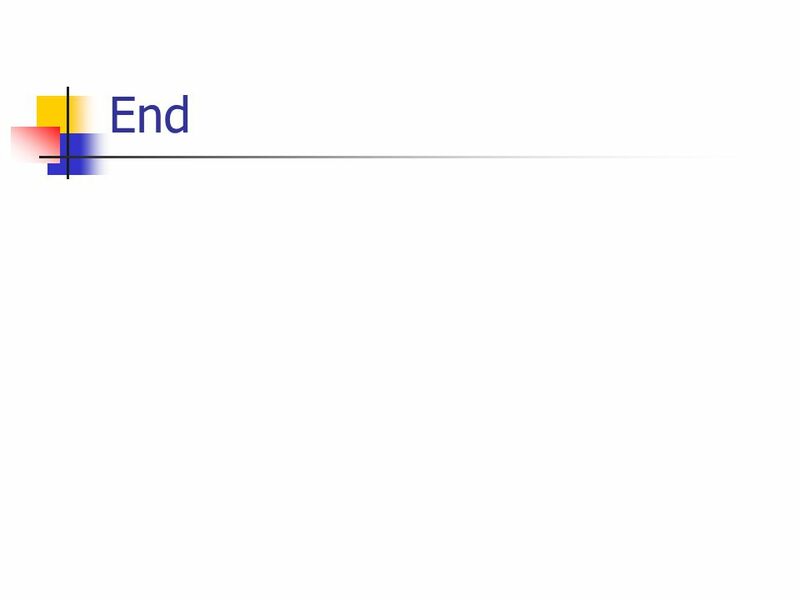 : “guaranteed bonus” 2007: SEC “fixes” table to capture SERPs, etc. 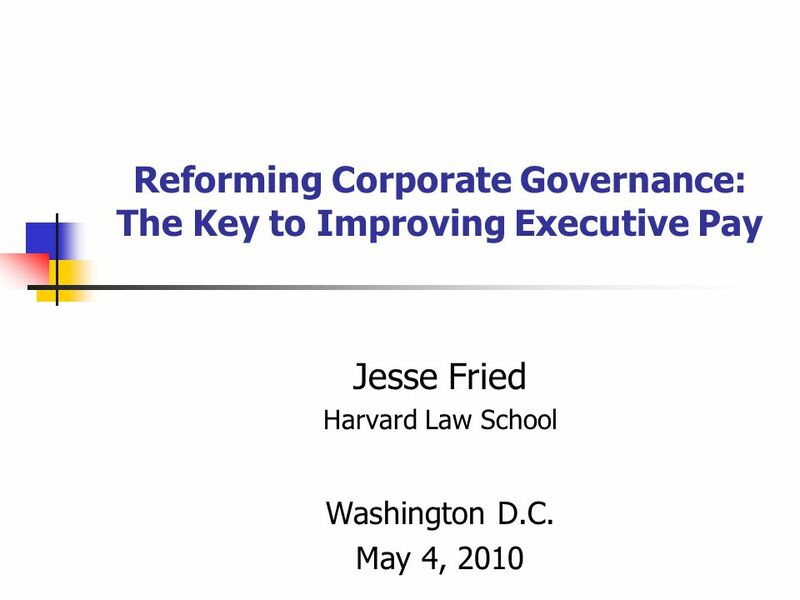 Download ppt "Reforming Corporate Governance: The Key to Improving Executive Pay Jesse Fried Harvard Law School Washington D.C. May 4, 2010." The Firm and Its Goals The Firm The Goal of the Firm Do Companies Maximize Profits? 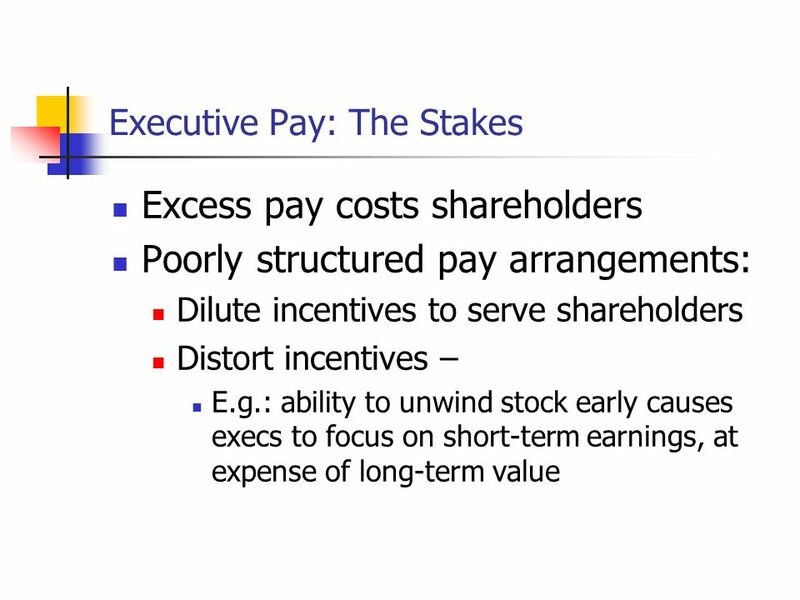 Maximizing the Wealth of Stockholders Economic Profits. James Wells Catherine Koene Pamela Feldkamp Josh Proksch Lorcan Duffy Francis Moniz. Greed is NOT Good! CIFP Four Educational Streams: Wealth Management Tax Planning Estate Planning Risk Management GREED IS NOT GOOD! Presented by Richard. How can firms raise money despite the agency problem? 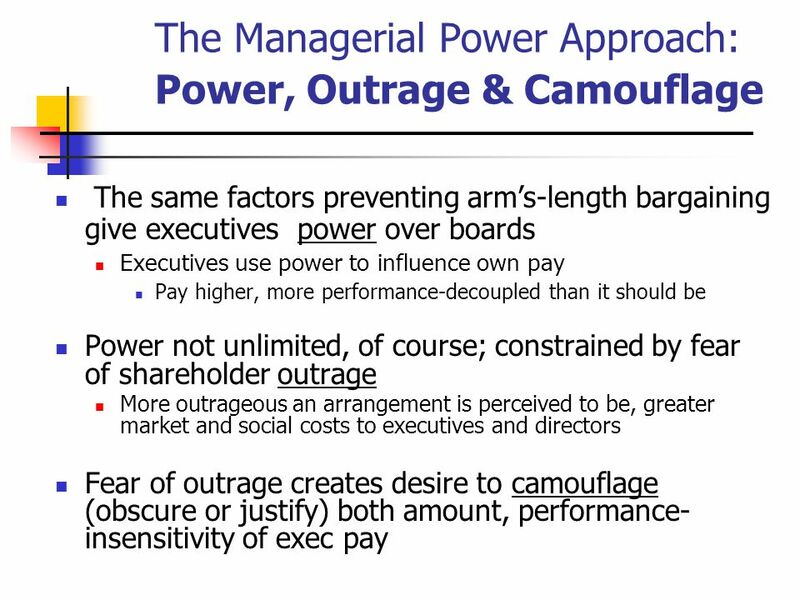 The prime aim: make you acquainted with a few principal corporate governance mechanisms (variants. 1-1 McGraw-Hill/Irwin ©2008 The McGraw-Hill Companies, All Rights Reserved Human Resource Management Gaining a Competitive Advantage Chapter 12 Recognizing. Stock Option Backdating and Practices Conference Presented by: Joseph T. Gulant, Esquire September 21, 2006. 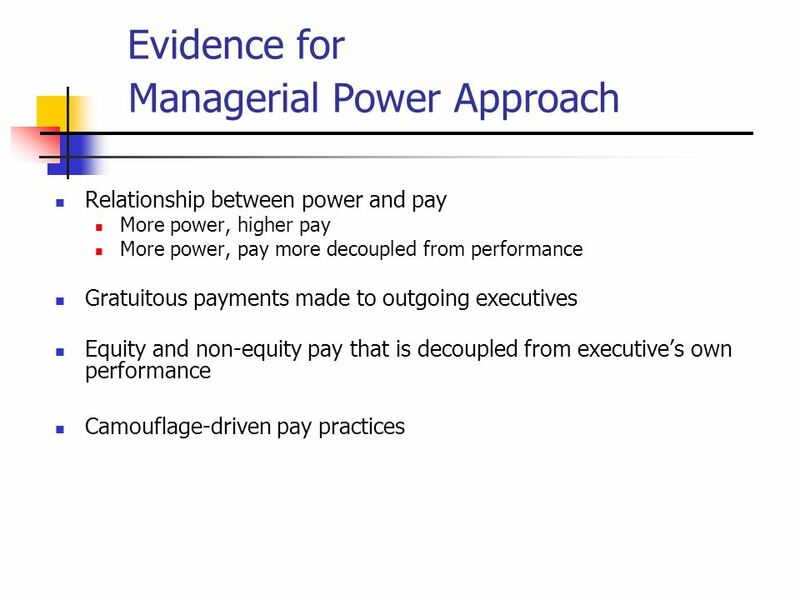 Executive Compensation: Something Old, Something New Marianna Makri & Luis R. Gomez-Mejia. Competing For Advantage Part IV – Monitoring and Creating Entrepreneurial Opportunities Chapter 11 – Corporate Governance. 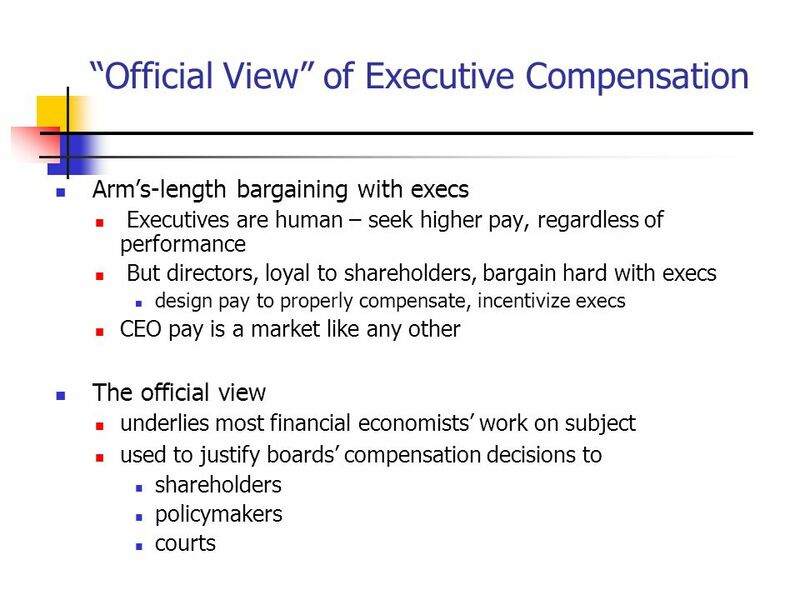 Executive Compensation in Widely-Held US Firms ESNIE 2007 Jesse Fried Boalt Hall School of Law U.C. Berkeley. Are CEOs Paid Too Much? CEO Salary Year Compared to Blue-Collar Worker Avg. 198042 times 199085 times 2000531 times Source: Business Week.